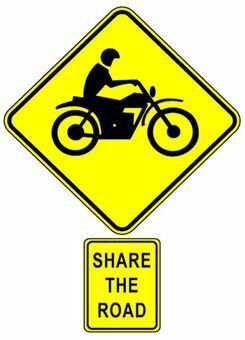 The NHTSA has tips on how to share the road with motorcyclist this summer. As the weather gets warmer, you can expect to see a lot of people out riding their motorcycles. And what better month to kick off Motorcycle Safety Awareness month? That's right, its May. The National Highway Traffic Safety Administration is reminding all drivers of cars, trucks and buses to look out for, share the road with, motorcycle riders. And to remember that motorcyclists have the same rights, privileges, and responsibilities as any other motorist on the road. Based on NHTSA statistics, there have been an increase in motorcycle fatalities in the recent years. In the year 2012 there had been 4,927 motorcyclist that were killed in traffic crashes. A continued increase from the year 2011 (4,630). These deaths accounted for 15% of the total highway fatalities within that year. NHTSA reports that the use of helmets is also on the decline, dropping about 66% in 2011 and roughly around 60% in 2012. Their data shows that head injuries are the leading cause of death in motorcycle crashes. D.C., among many other states, have a universal helmet law that requires all riders to wear helmets. Another factor in motorcycle accidents is alcohol. Twenty-seven percent of all riders in fatal crashed were under the influence of alcohol. This percentage comes higher than the 23% of fatal crashes that occurred in cars. Wear DOT-compliant helmet and other protective gear. Ride in the middle of the lane where you will me more visible to drivers.